Maldives Customs Service reported they received a revenue of MVR 183.8 million as Import Duty for the month of June. According to Customs’ official statistics, the Import Duty for last month is an increase of 11 percent from last year. 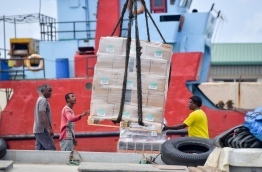 Statistics show that goods worth MVR 2.8 billion had been imported to the Maldives in June, which is a yearly increase of 14 percent. The worth of imported goods sans oil products last month stood at MVR 2.5 billion, which is an increase of 28 percent. The statistics indicate that 24 percent of the imported goods in June were machinery and electronics with an approximate worth of MVR 636 million. The second highest percentage of imported goods were food products at 21 percent. Meanwhile, MVR 218 million worth of local products had been exported in June, according to the statistics.